Dirk Roeda, 3-4-1951 - 19-7-2013Dr. Dirk Roeda, of Service Hospitalier Frédéric Joliot, passed away on July 19. Dirk Roeda was born in 1951, April 3rd, in Weesp, The Netherlands. He studied organic chemistry at the Vrije Universiteit of Amsterdam with Pr. Fritz Bickelhaupt and subsequently completed a PhD thesis on the radiosynthesis and application in radiopharmaceutical chemistry of carbon-11-labelled phosgene at the same university (1982). This work was in part carried out at the Service Hospitalier Frédéric Joliot (CEA) in Orsay, France (Dr. Dominique Comar). Dr. Roeda then moved to Turku (Finland) to join the Turku Medical Cyclotron Project of the University of Turku and Åbo Akademi, the infant stage of today's national Turku PET Centre, to contribute to the further development of the radiochemistry activities there. In 1986, he joined the medical physics department of the University of Aberdeen (Scotland) under Prof. John Mallard to participate in the setup of a PET chemistry laboratory from scratch, including the installation of a second-hand CS30 cyclotron. 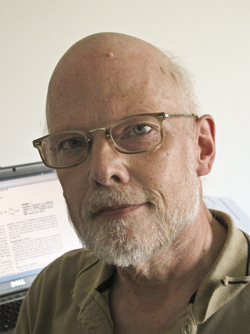 In 1993, Dr. Roeda returned to Orsay (France) to join Dr. Christian Crouzel's radiochemistry group at the Service Hospitalier Frédéric Joliot, where he pursued his research interests on the development of methodologies in carbon-11 and fluorine-18 chemistry, notably the synthesis and application of carbon-11-labeled one-carbon synthons like formaldehyde, formic acid, formyl chloride, carbon monoxide and phosgene as well as the exploration of novel routes of radiofluorination.